Below you see the entrance to Medical-Sanitary Unit #122 in the Name of Sokolov. 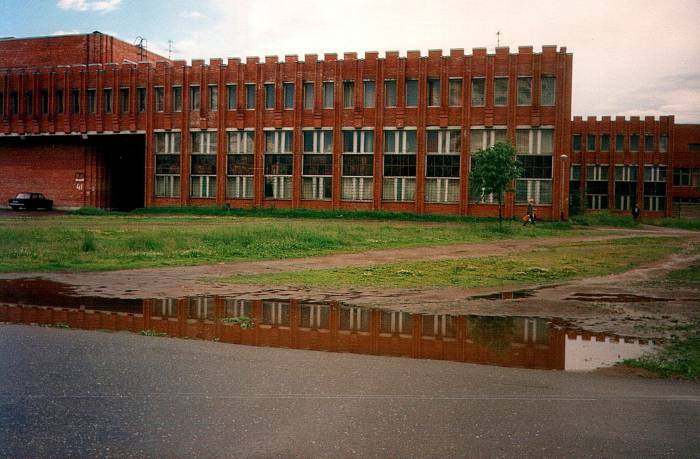 This is where the AIHA project was based, in the northern suburbs of Sankt-Peterburg. Well, "Medical-Sanitary Unit #122 in the Name of Sokolov" is a word-for-word literal translation of the name. But it's probably closer to reality than the way the Russians tended to refer to Louisville's Jewish Hospital as "The Kentucky Hospital for Jews". — No, no, it's not a hospital for Jews! — Oh, sorry. The Kentucky Hospital of the Jews, then. That large puddle, toward the yellow car, is probably at least knee deep. 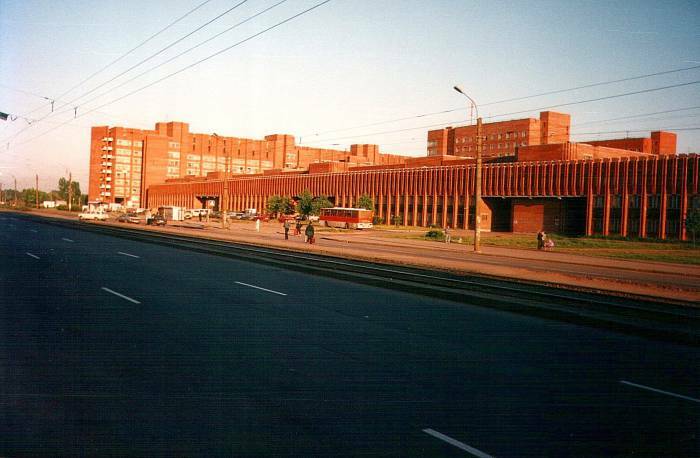 Here is a view in warmer weather, taken from further back at Lunacharskovo Prospekt, the main street running along the front of the hospital complex. The picture above is of where you enter, beyond the kiosk with the yellow sign seen below. Even though the hospital is out in the suburbs with plenty of open fields around, it is very narrow with nine stories above ground and two below. Not such a good design for a hospital, where many people can't get around easily. The hospital complex stretches along a long city block. It took several visits to learn the whole story about the occupants. 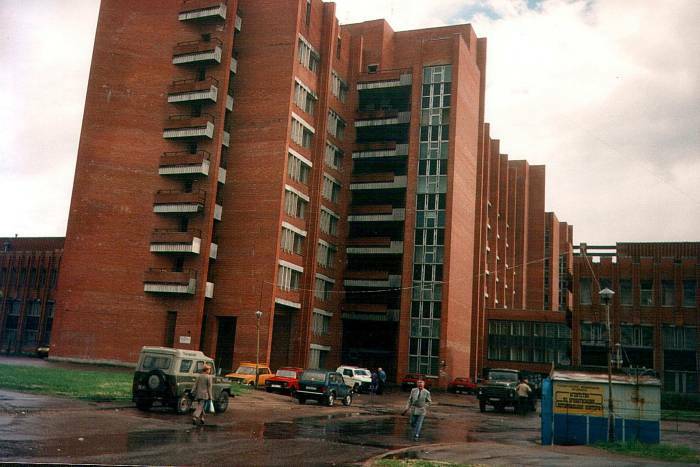 Hospital #122 is the front two-thirds of the tallest section at the left (the east end) as viewed looking south off Lunacharskovo Prospekt, as seen above. Hospital #122 was dedicated to Minatomprom, which I've also seen called Gosatomprom, in the days of Soviet administration. Minatomprom was the government agency responsible for the design, construction, and operation of nuclear power systems, both for electrical power generation and naval applications. There was a Minatomprom factory nearby. Many of its employees lived in the neighborhood and got their medical care here. Polyclinic = a medical clinic, several medical and dental practices and some self-contained medical/dental labs. Область = Oblast' = a regional government, larger than a municipality but smaller than a rayon or kray. In western Russia, a typical oblast' might be several tens of kilometers across. Out in the middle of Siberia, maybe a few hundred kilometers. The oblast' organized in Soviet days around the city of Leningrad was, logically enough, Leningradskaya Oblast'. When the city changed back to its pre-revolutionary name, the oblast' did not. 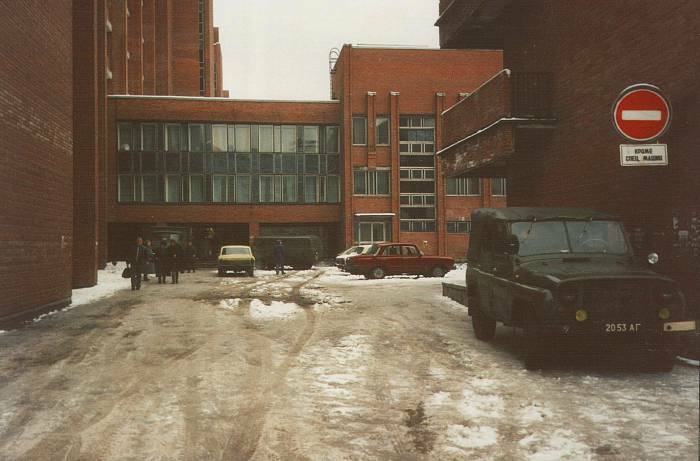 The rear third of the nine-story section was a hospital for the militsiya, or police. It looked like one continuous building from outside, but inside there was no connection between the two parts. Adjacent to that, to the right of the entrance above, was a polyclinic for Leningradskaya Oblast'. Four stories above ground, two below. This picture shows some warmer weather at the end of the spring thaw. Plenty of standing water and mud. This is taken from the same place as the above picture, but turned toward the right. Further down the block, the building dropped to three stories above ground and one or two below. We never got a complete description of what occupied the building. There was a relatively small morgue for that section of the city. And, I think, some small medical and dental labs. The far end, behind the trees seen above, and just short of the cross street with the apartment blocks beyond, housed a post-graduate nursing school. Here is the post-graduate nursing school. It has a kitchen and dining room, some offices, and a collection of rooms. A few small meeting rooms, but mostly it's more like hotel rooms. We stayed in those rooms and had our meals in the dining room. Very odd — it's like the dormitory for a post-graduate school, but without the school itself. See the large dark doorway above. It has a large metal gate that can be closed, but when fully open you could drive a car through it and into an interior courtyard. The nursing school entrance was in that courtyard. As in the main hospital, there were many internal walls dividing the building, not obvious from outside. The hallways on the third floor stops at the same place the halls on the first two floors must stop, at the right side of that large doorway. Whatever is behind the third floor windows above the large doorway is accessible only from the section to the left. That section was occupied — from where we were, we would see lights in that next section, and occasionally someone moving around. But if we asked what was there, no one seemed to know. Also, a wing protruding out the west end behind where we stayed was beyond yet another set of unbroken internal walls. That wing housed, well, who knows what. 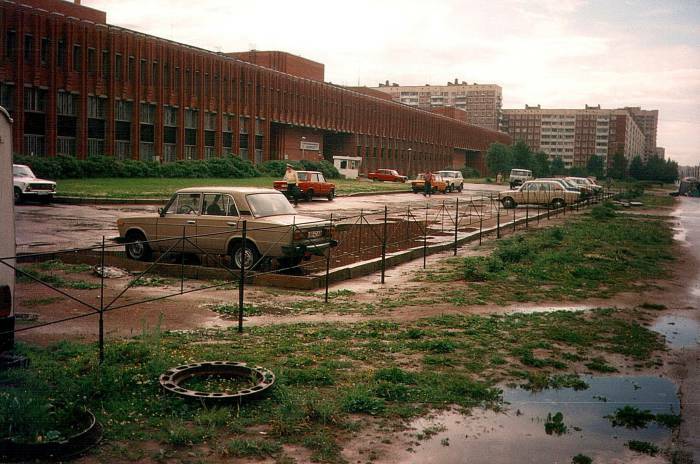 Here is a view from the middle of Lunacharskovo Prospekt in front of the post-graduate nursing school, looking toward the main hospital. Below is one of the first things I fixed there. 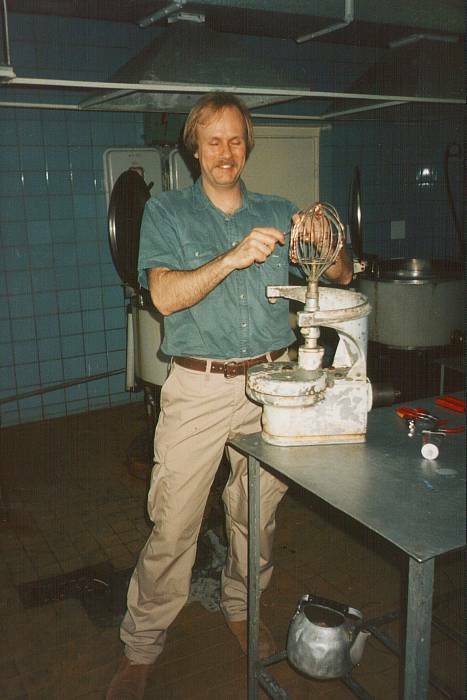 It was an institutional-sized multi-purpose food processor. Largely a large and powerful electrical motor in the white case, with a rotating power coupler at the top. 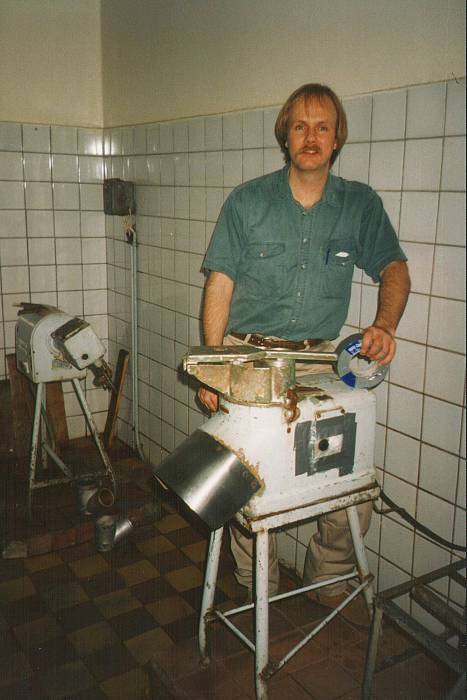 With the appropriate fittings it could be used as a meat grinder, vegetable chopper, etc. 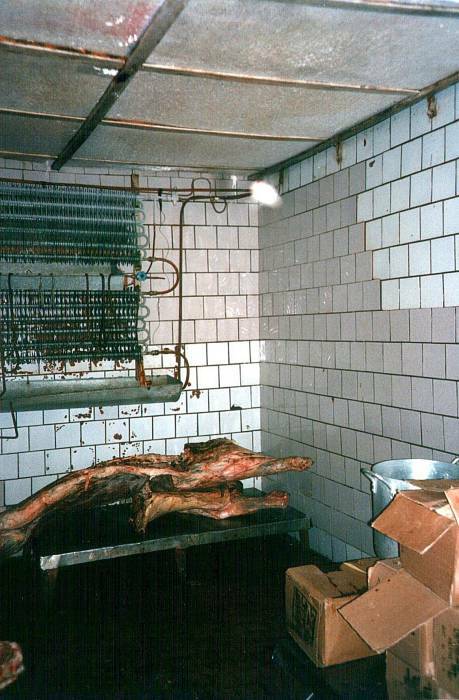 Food is inserted into whatever you attach to its top, and comes out in processed form under the stainless shroud at left. It ran on 240 volt AC power, of course. Actually, 240V three-phase power, just to be fully industrial. And it was used in a room that was cleaned with a hose and drained (at least in theory) by a drain located in one of the higher spots in the floor. 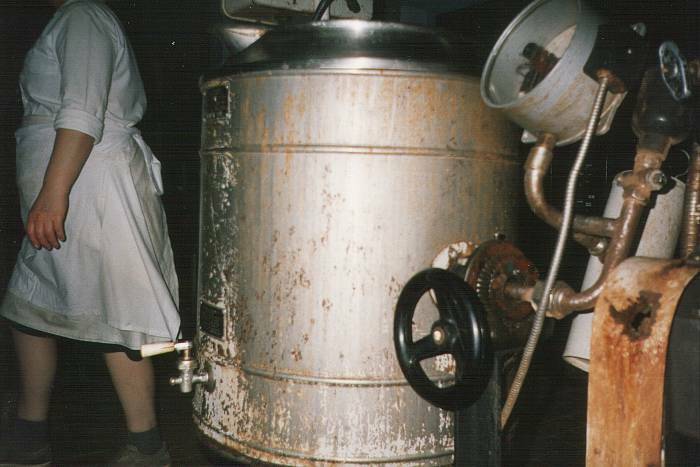 The unpleasant job for the lowest-ranking kitchen worker was to turn this beast on and off. Power was controlled by rubber-capped push buttons. But the rubber was largely broken away, exposing the electrical contacts. Note the above references to standing water and 240 VAC. The solution involved beating on the side of the case with a thick wooden club while jumping around in an attempt to hit it while airborne. My solution was to cut a cover square of flexible clear plastic sheet, and then fasten that into place over the buttons with duct tape. Problem solved! With the risk of electrocution drastically reduced, the kitchen established an immediate menu change away from boiled potatos and toward chopped vegetable dishes. And a lesson was provided: You can never have too much duct tape. Trading American blue jeans for goods? 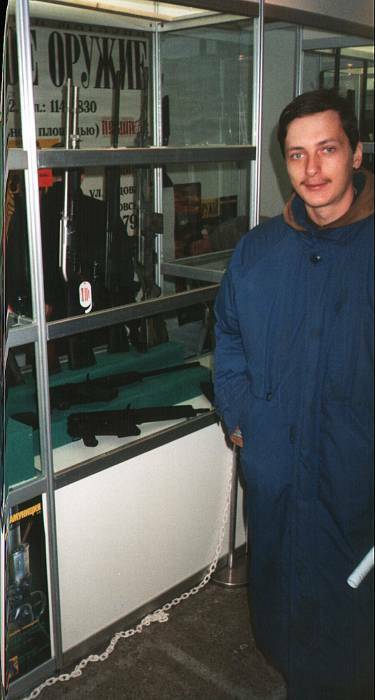 Only back in Soviet days! Now duct tape and caulk form a much more valuable currency of exchange. My generalization of Soviet construction: they were very bad at producing sticky things, and the Russians haven't gotten much better. If it needed to stick to something, or stick together, it probably didn't. Wallpaper blisters and peels. Linoleum flooring forms low swells attached to the floor only in places. Exterior concrete walls spall off in large chunks. Plaster cracks and falls away from interior walls. As for the concrete, I was told that during Soviet days there would be a quota for production of concrete. If there was not enough cement for making enough proper concrete, the volume would be made up by adding sand and water. All that mattered was the delivery of so many cubic meters of nominal concrete. Once it was poured into forms — Soviet-produced material assembled by Soviet workers into a Soviet design — it was beyond questioning. Yes, the first Russian winter would make large divots spall off the walls of apartment buildings. This produces an appearance of having been shelled by light artillery. But no one would mention this, as doing so would question the unquestionable. I would travel to Russia with many rolls of duct tape and tubes of silicone caulk. I was soon the hero of the kitchen. Given my wizardry with the motor unit itself, maybe I could somehow heal a broken mixing unit? 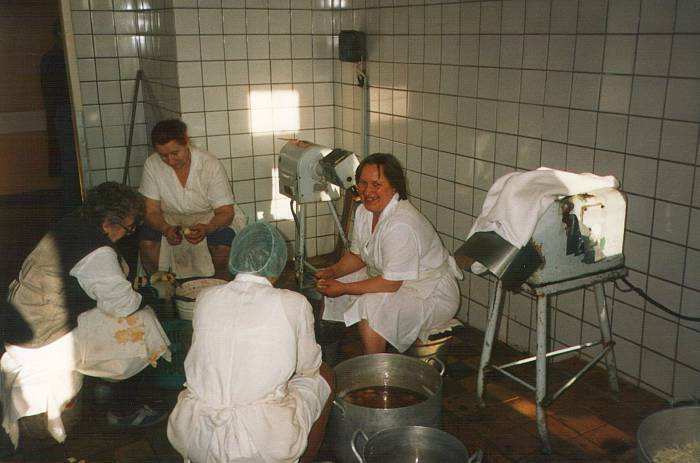 This happy potato-peeling session will be followed by the first safe use of the food processing machine in years. With Gene Younger, getting ready to re-weave a food beater with Romex. Yes, given enough heavy wire intended for electrical service, you can strip off the insulation and weave some bracing for the mixing loops. Russia should be the richest country in the world given its mineral resources. But the hospital was built during a time when the military got great material and health care got things built out of pot metal. Not that pot metal is good even for pots. Some of the food preparation areas were in pretty good shape. It was pretty amazing to see how the Russians got along just fine with some really disfunctional equipment. 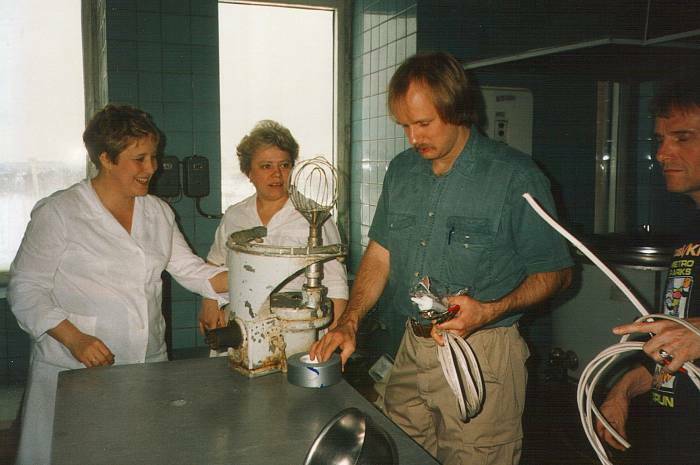 After some work in the kitchens, which were on the top floor, we went to the food storage areas, which were in the basement. No, that doesn't make sense to me, either, but that's where those two related areas were located. 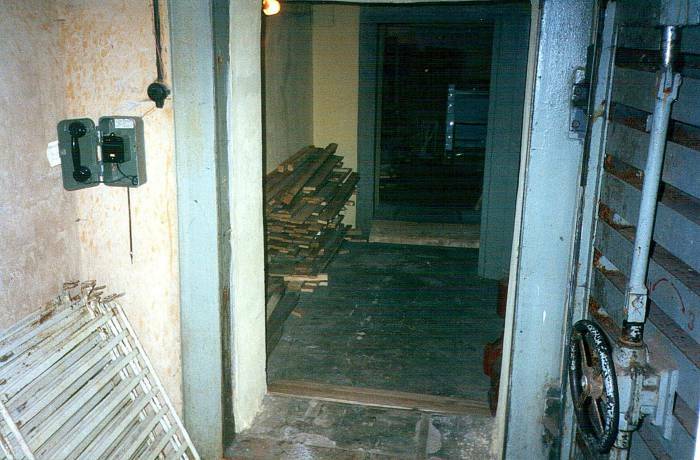 You took the freight elevator (or ten flights of steps) down to the basement, then down a tunnel into a dark area. Somewhere back in this dark area I tripped as I walked through a door. The molding down the side of the door frame was loose from about the middle on down, and it was warped and stuck out about a foot at the bottom. I was carrying a hammer and a bag of nails, and told everyone to wait a moment while I nailed the molding back into place. They told me not to worry, they were all used to it, the door frame had been that way for several years now. Several years!? Doesn't anyone else trip on it like I just did? Yes, we all trip over it, but it's been that way for several years and so we are all accustomed to tripping over that broken door frame when we come down this dark hallway. Well, I hope no one gets too mad, but I'm aggravated by tripping over it one time. So, I'm going to nail it back into place without getting permission to fix it. I think I gave them some useful ideas. 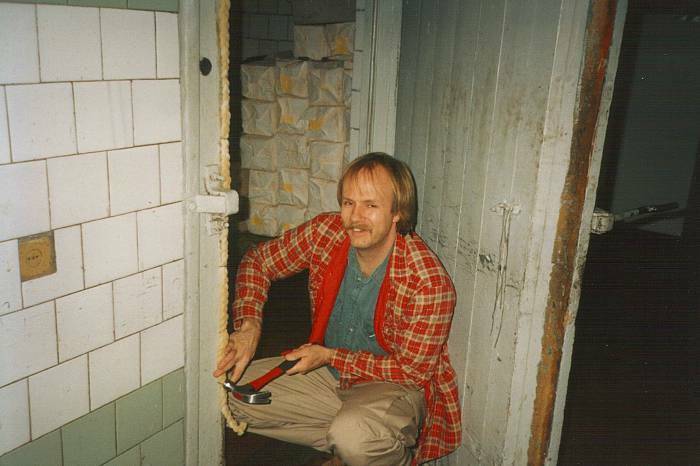 Later that day, one of the Russians who was with us at the time borrowed my hammer and bag of nails. He came back after nailing all sorts of things back into place. After my one-minute repair of the past decade's problem, we continued down the hall into what looked like the dungeon. 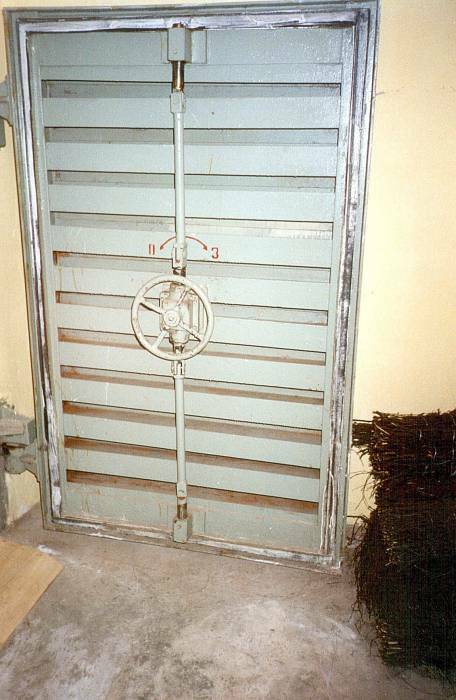 Very heavy wooden doors set into a concrete wall. 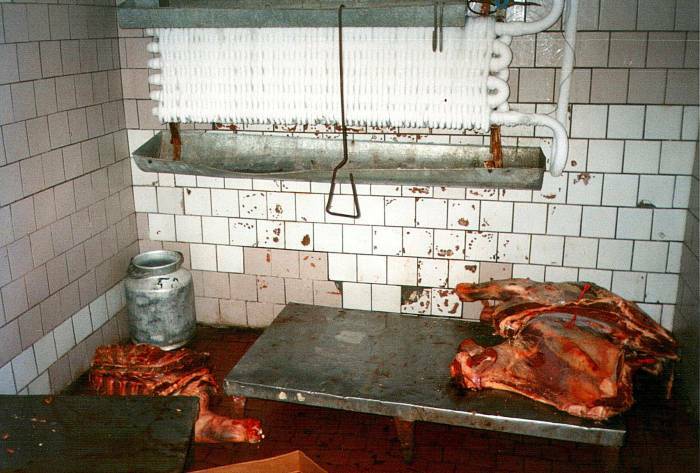 These were the cold rooms for food storage. Or at least cool rooms — they weren't staying cold enough. Not all of them had the defrost issues seen below. 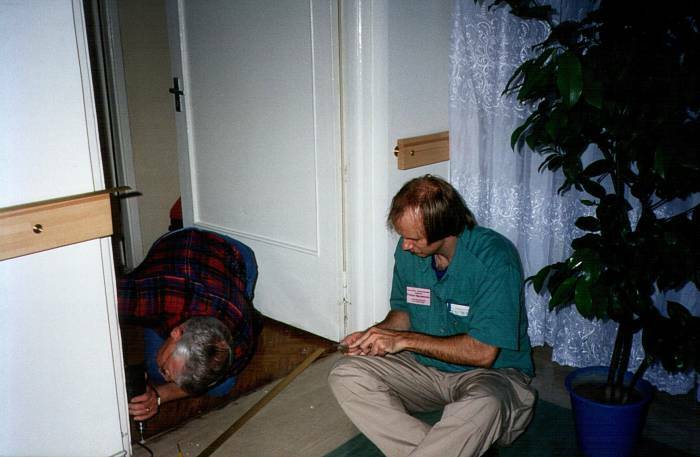 The problem was that the heavy wooden doors didn't tightly seal against the door frames. At least the potatos and onions and cabbage were more tolerant than the meat. Installing some field-expedient door seal. Just run to the store and pick up some weather-stripping? I don't know how many days travel it would have been to the nearest home-repair supply store at the time of these trips. I'm sure it would be very different today. Where did I get my supply of nails? From the wood shop. Although it was the hospital's wood shop, it was dedicated to the construction of wooden cabinets for video gambling machines. Sort of like how the hospital's metal shop had a car engine up on the bench. They were nominally the hospital's shops, but they were really operating as private businesses. But both were like shops most anywhere. Wander in, show some interest in and appreciation for what's going on, and you're in. Complement the nice design and construction of the video gambling cabinets, and you could always get more nails from the wood shop. Another room in the food dungeon was used for storing dry goods — sugar, flour, and so on. Or, that is, food that is supposed to be dry. However, water was seeping through the ceiling and dripping down onto all the foodstuffs stored in wooden barrels and cardboard boxes. What could be done? I suggested going to the level above to figure out where the water is coming from. I figured there was a broken pipe somewhere. We should find the problem and fix it at the source. If we instead just sealed up the plaster ceiling somehow, water would collect up there and quickly break through in a huge messy flood. One of the Louisvilniki was the Jewish Hospital head engineer. He gave me a funny look for making The World's Most Obvious Comments. But, they weren't obvious, this radical approach startled everyone. Yes, that is a good idea! We should find the leak and fix it! I suppose that the plaster ceiling could not support great weights of water. So, what's on the floor above us? It's where the cars park. This wing of the basement extends out under the parking lot. The eventual solution involved plastic sheeting and a lot of duct tape. A sloping plastic "ceiling" above the top level of shelves now caught all the dribbling water and directed it to one corner, where it could pour to the floor and drain away. There were lots more projects generally involving the replacement of non-sticky material with sticky material. Like linoleum sheet flooring that wasn't fastened to the floor on either side of a joint in a doorway. With Jack Waldrip, the head engineer from the Louisville hospital, repairing flooring. Or some plaster-lath brick-core walls that were losing their plaster. 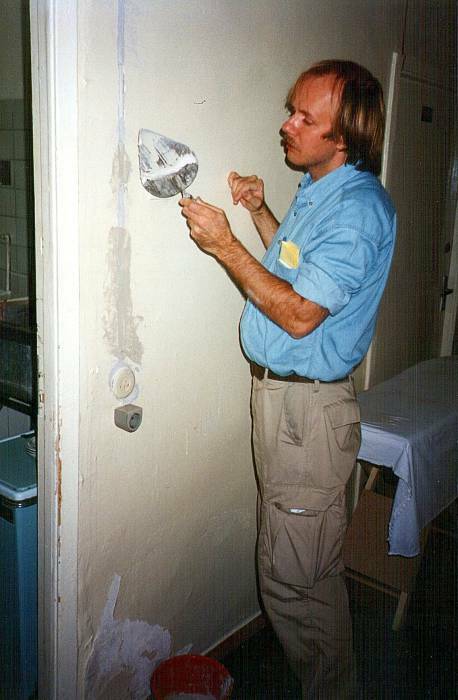 You can do a lot with a large supply of drywall patching compound, even if there is no drywall involved. Eventually the project included some computer work. 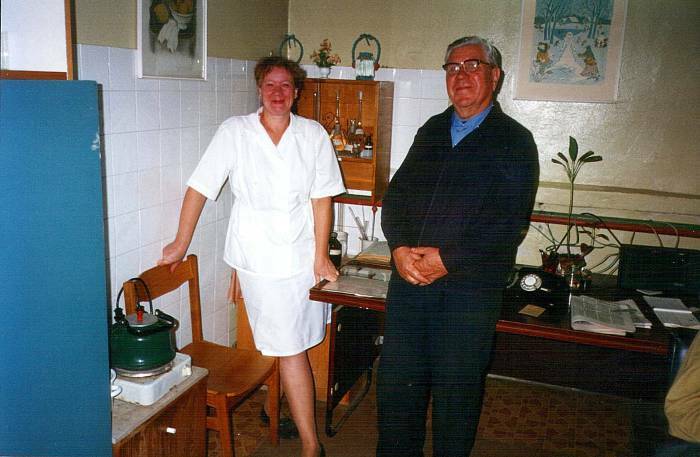 AIHA, in their backwards way, had roped the hospital into a connection through GLASNET, an organization that had been about the only UUCP Internet connection to the Soviet Union back in the mid-late 1980s. It had been the only connection back then, but it had never been updated. There was pretty good connectivity to Sankt-Peterburg in general through a fibre connection via Helsinki. But AIHA had obligated them to use a connection run through what seemed like thousands of miles of wet string. Running traceroute from the central U.S. to the hospital showed a fast connection as far as the San Francisco area. Then there was a satellite hop to somewhere near Moscow, with all the speed-of-light latency of a hop out to geosynchronous orbit and back. But from there it got much worse, hop-by-hop slower and slower along the rail line from Moscow to Sankt-Peterburg. Connecting out the opposite direction required first getting to and through a Soviet-era rotary phone switch. On rainy days, you might as well not try. A couple of hours punching the "redial" button on the phone at the anti-ergonomic work area revealed some shortcomings of the phone switch. The pulse dialing let you count the pulses and verify that you were dialing the same number. Sometimes you got the modem through a haze of crackling and hissing, but sometimes you got someone's annoyed grandmother saying "Allo? Allo?". Sorry, babushka, the phone switch misconnected us. If you did get get lucky and get the modem, the two ends couldn't sync up through all the noise on the line. Wait for things to dry out. Even when it did work, AIHA's preferred GLASNET connection provided an old-time BBS-like interface. They were limited to two hours a day (although it was tough to connect at all! 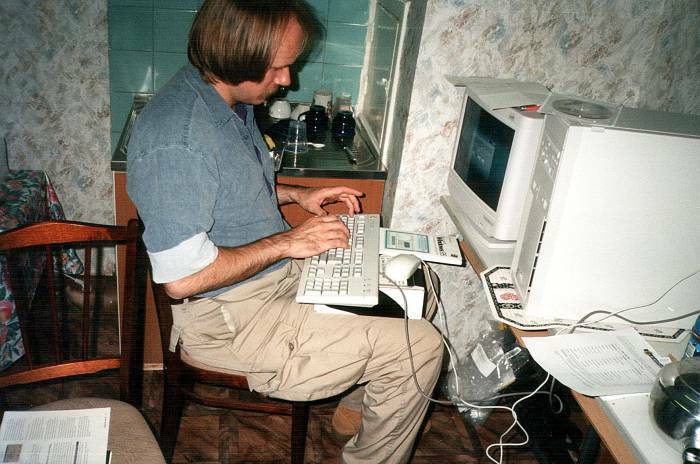 ), and it was more expensive than the dial-up TCP/IP offered by Sankt-Peterburg ISPs. After a few trips the computer situation got a little better. The hospital's electrical engineer showed me an uninterruptible power supply they had received. Software provided a "control panel" showing the input and output voltages and current battery charge level as colorful graphical meters. Usually this display is boring, but on the Russian power grid it was much more interesting. The input voltage was swinging from about 190 to 250 volts, explaining the occasional flicker in the lights when it dropped through the low end of that range. I had not been there during the summer, and so I did not know if they had electrical storms and the associated electrical power problems. I asked if they saw any voltage spikes on the power line. The question got misinterpreted as a wishful enquiry from someone hoping for them. Speaking of wiring, here's a wiring closet. It's a mix of phone lines, cable television, and the traditional "radio" signal lines. A system called "radio" during Soviet days consisted of city-wide distribution of one or two audio programs over baseband or maybe on carrier current systems. The "receiver" in your home was really just a box with a potentiometer, an audio transformer, and a speaker. "Turning it on" was just connecting the speaker to what amounted to speaker wires from the amplifier downtown, with the volume set by the potentiometer. The wires still go everywhere, but there are no signals on them. See the description of this system in the 1970 Leningrad telephone directory shown on another page of mine where I explain how to interface a 1955 Soviet-built telephone to today's GSM network. Багта-50 rotary-dial telephone, now interfaced to the GSM network. The outlets used for the "radio" connections in all buildings were the two parallel slots used for power connections in the U.S. This baffled most Louisvilniki. 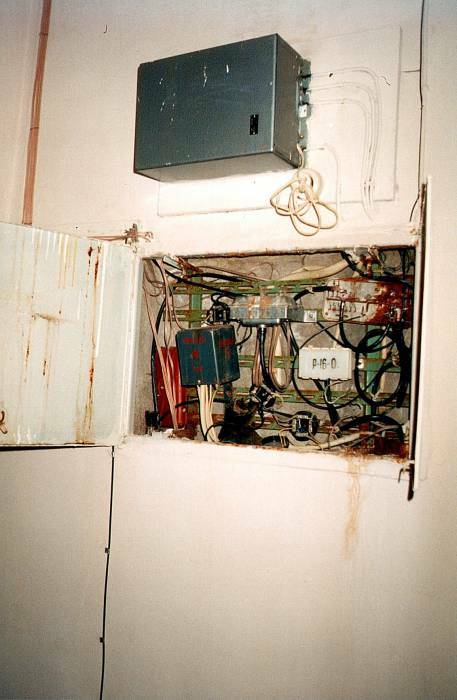 They promptly plugged their U.S.-power 120V 1800 watt blow-driers into a dead circuit that, if it were still operating, would have provided only a few volts of audio signal. Then they plugged their 1800 watt blow-drier into a converter rated for maybe 40 watts, tops, and plugged that into the real 240V power outlet in the wall. When that only hummed and made the converter very hot, most of them complained to me that there was something wrong with the electrical power and I needed to fix it. Radio or radiotranslayatsionnoy network details in the 1970 Leningrad telephone directory. The more persistent ones plugged their 1800 watt blow drier into a 40 watt converter, plugged that into a second 40 watt converter, and plugged the whole chain into the wall. That didn't even hum. I also got reports on the non-humming multi-converter combinations. I would usually remind them that I had warned everyone before the trip that you cannot run an 1800 watt blow drier on some 40 watt converter from the mall. They would then inform me that "the guy at the mall" had assured them that this would work. I would point out that they were in Russia with a useless converter, and the guy at the mall was in Kentucky with their money. Sort of a twist on the traditional Russian saying, "God is in Heaven and the Tsar is in Moscow (and therefore I can do as I please out here in Siberia)"
Why do American blow driers require 1800 watts of electrical power? Because American domestic electrical power is 120 VAC, and domestic circuits are fused for either 15A or 20A current depending on the wire size and fixtures used. And 120 volts times 15 amps is 1800 watts. So, 1800 watts is the maximum power drain that can just barely run in an American house without tripping a circuit breaker. I await the arrival of 3600 watt blow driers that require a 230 VAC supply like a clothes dryer or oven. This was usually interpreted as a sign that I had not really heard the part about how the guy at the mall had said that this would work, and so I was told that part again. Sometimes with further descriptions of the humming. Meanwhile, I kept my real 120V/240V transformer away from them. It was fine for running my drill and my soldering iron. 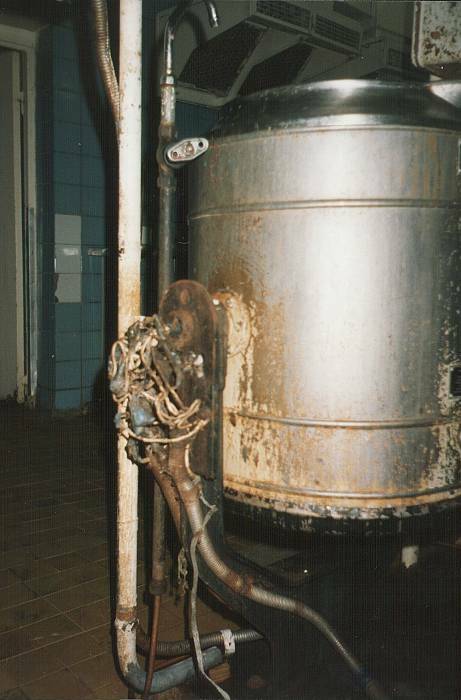 But their blow driers needed something more like Reactor #2 at Chernobyl to get up to full speed. Oh yes, we get voltage spikes, 10 kV, 15 kV, no problem! Wow, there must be some bad electrical storms in the summer. Oh no, not from storms. Switching transients! Big spikes! All the time! No problem! My report to AIHA when I returned mentioned that if they were going to continue shipping computers to Russia without sturdy surge protectors, they probably should just destroy the computers in the U.S. and save on the shipping. On a later visit to Russia, I found surge protectors everywhere. Huh. Someone looked at some of the reports. The Hot Line to Moscow. Ah, the life of a remontnik! Here is how we got around when we weren't taking the tram and the subway — a van. 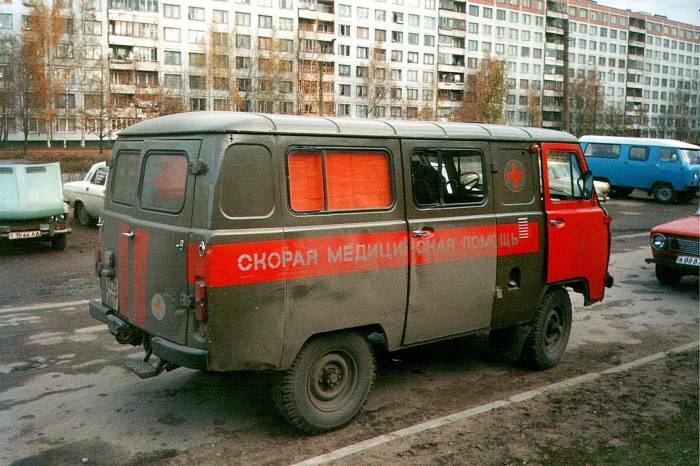 Add a paint job with a red stripe and the label СКОРАЯ МЕДИЦИНСКАЯ ПОМОШЬ, Skoraya Meditsinskaya Pomosh', or "Fast Medical Help"
I suppose the most surprising part is that the rack wasn't there to start with. This picture shows something that I can easily recognize but cannot fully understand. It seems that there is nothing that completes a Russian window better than an orange curtain made entirely of artificial materials and fastened tightly over the entire window so that nothing can be seen through it. Driving through Sankt-Peterburg was always some variation of a bumpy ride in the back of a darkened van, bathed in a murky orange light and strong gasoline fumes. No real idea of where we were going beyond what little we could see out the windshield from the back. Train station ticket offices have large windows entirely blocked on the inside by orange curtains. Or sometimes a dull gold color. The original opening through this window has been blocked with a plywood panel. This panel has a tiny hinged door in it. All your ticket transactions are done through this little opening, which is down around your waist level. What little you can make out of the ticket office itself indicates that the staff must be sitting on very short stools, because they are looking up at you through this tiny low hole. I don't know why it's that way — it just is. The shelter housed the storerooms. Upstairs in the hospital, repair parts were needed for many things. Down in the storerooms, many things were stored in meticulous order. In fact, it was the most orderly place I ever found in the hospital. At the time we stumbled into this, before a currency adjustment, the exchange rate was between 5,000 and 6,000 Rubles per U.S. Dollar. The storerooms were filled with wooden shelves with neatly-labeled supplies and repair parts. Their prices were probably last updated in the mid to late 1980s, when the artificial official exchange rate was still something like 1 Ruble to 2 US$. Back in the day, prices were marked in Rubles and Kopecks, 100 Kopecks to the Ruble. So here was a shelf with an array of hemostats of various sizes and designs and marked with costs of 1R 65k to 3R 30k. Or, at the current exchange rate, 0.0003 to 0.0006 US$. However, these supplies could not be used for anything, because of some obscure bureaucratic reason. So there they sat on shelves, cheaper than the ink used to mark their labels and utterly unavailable. A few people worked down there. Or at least they had paid positions. Given the inability to provide anything, and the fact that the inventorying and labeling was completed back in the 1980s, it was very easy work. One day they wanted to show us the water system. This involved both the water supply from the city and the water filtration and chlorination for the therapy pool. Off we went down some hallway, and down a stairway through a hatch in the floor. Some bent-over walking through a low section of sub-basement led to the hot and cold water lines (orange and blue here, respectively). Hot and cold running water from the city's heating plant. Blue is cold, orange is hot. Well, except for the month of August, when the hot water plant is shut down for maintenance. And then most of the month of September and maybe half or more of October, because some critical workers were on holiday in August and the repair work didn't even get started until some time in September. Yes, hot and cold water lines. 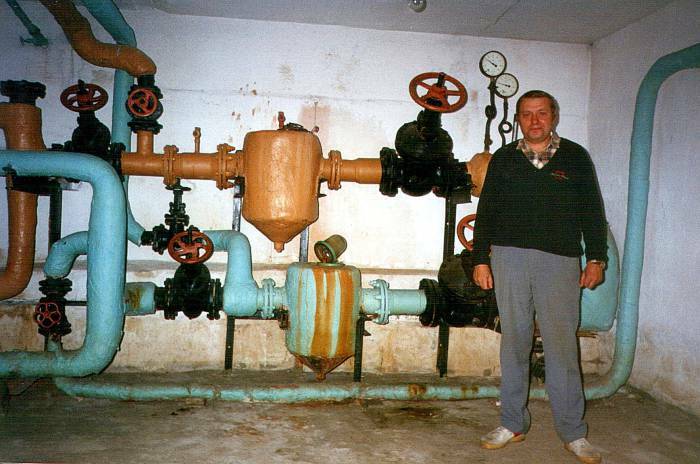 The Russian system, really the Soviet system they inherited, has no water heating in individual buildings. The municipal system provides both cold and hot water from a central plant. Doesn't the hot water get a bit cool when it's pumped a long distance in a Russian winter? Well, if everything is working, it works fairly well. If everything is working. Har. Russians are masters of ironic humor. The reality in Sankt-Peterburg is that every August the hot-water supply is shut down for a month of maintenance. At the end of August, as things usually go, it is noticed that no one did any maintenance. So it's time to start the work. The hot water will probably be back on by the end of September. If the workers get right on that project. That's just the temperature. The flora and fauna are a bigger problem. The water in Sankt-Peterburg is not safe for human consumption. Even the water provided to the hospital is full of giardia lamblia, a protozoan parasite causing a rather spectacular form of diarrhea (one reference describes it as "copious and explosive, with an unusually oily consistency"). You can't build any immunity or tolerance to giardia, so even the locals have to boil all their water. We saw the therapy pool from below, and made appropriately appreciative remarks about its filtration and chlorination. Then we were introduced to the Keeper of the Water of the Swimming Pool. Actually we were taken into the Office of the Keeper of the Water of the Swimming Pool. This was a surprise. At the Louisville hospital, therapy pool water maintenance was just one of many tasks of one of the engineering staff. It occupied maybe 15 to 20 minutes out of his day. Here was someone who had made a full-time job of it. Really it was more than that. 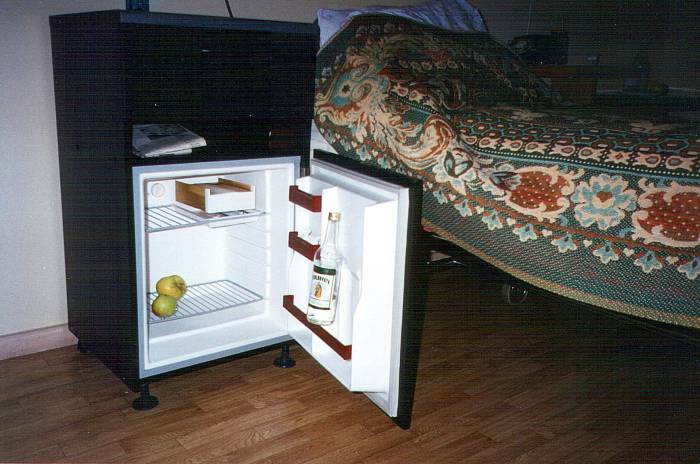 The Soviet model still in use at the hospital made it a 24-hour job. You would show up for a 24-hour "work day", although it was expected that you just hung out there for 16 of those 24 hours. OK, at least 16 hours, more (or much more) if there wasn't much urgent business. And so your office was sort of an apartment with a television set ("so you have something to do to pass the time"), a liquor cabinet ("so you have something to drink while you watch television"), and a bed ("so you have somewhere to sleep after drinking and watching television"). The Keeper of the Water of the Swimming Pool was amazed to not only have visitors, but American visitors. I don't think he had ever met any Americans, or even seen any from a distance. 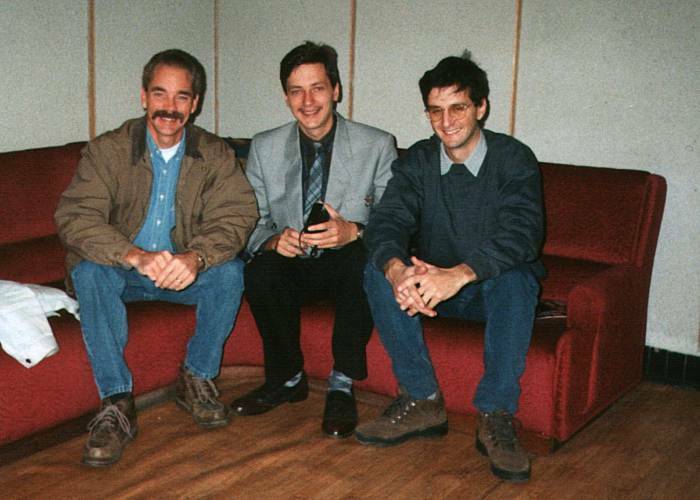 To have some American engineers appear at his office to meet him and talk shop was really something. We wished we had a camera with us. If we could give him a picture with all of us together, that would really give him something to brag about to his visitors. They must be some fairly infrequent visitors, given the need to go to the basement, down the hatch, duck-walk through the very low sub-basement, make your way around the water lines and the bottom of the swimming pool and all the filtration gear and so on. So the next day we took a camera and went off on an expedition to find our way back. We arrived at his office to find two women in lab clothes messing with the chemistry set in his chemical cabinet. What's up, are they here from the government to make sure the testing is accurate? No, they're here to do the testing. It turned out that he didn't know anything about testing or manipulating the water chemistry. His paid position as Keeper of the Water of the Swimming Pool was entirely ceremonial. Here are two of the three staff members who work around the clock to maintain the pH and chlorination. Well, staffed around the clock, anyway. The Keeper of the Water, at right, and one of the actual testers, at left. Above are The Bed of the Keeper of the Water of the Swimming Pool, and The Liquor Cabinet of the Keeper of the Water of the Swimming Pool. Another day they took us to see the Fan Control Room. Here it is — control panels and cabinets on the scale of props from 1950s science fiction movies, all to turn ventilation fans off and on. As you can probably guess by this point, the Fan Control Room had several staff members there on 24 hour shifts, with televisions, liquor cabinets, and beds. There's not much to do, because most of the indicator lights were burned out. You can't tell which fans are running. Yes, American hospitals run around the clock. But this one pretty much shut down by 4:30 PM and didn't really get running until at least 9:00 AM the next day. The patients stayed overnight, but most staff went home and the hallway lights were turned off by 4:30. 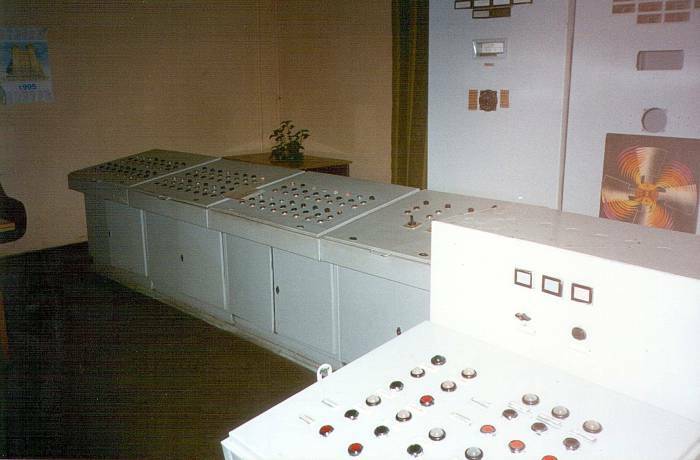 The Fan Control Room was idle 1630-0900 daily, but it was staffed around the clock. As for the Emergency Room, it only operated 0900-1630 on just three days out of the week. You need to carefully plan your emergencies, or else carefully memorize the operating schedules of the emergencies rooms of various hospitals in the area. There are no two-way radios in ambulances. I asked how the ambulance crew provides advance notice of the case they're bringing, so the ER staff can get things ready. "We do that when they arrive", I was told. The hospital has lots of stairwells, and a few small elevators. All the elevators had operators. Someone paid to push the buttons on the automatic elevators. If the elevator operator weren't in there, you could squeeze in four passengers instead of three. If asked, the elevator operators were explained as being needed because the patients are sick and can't be pushing their own buttons. But some of the elevators were for staff only. Once I worked on some patient call boxes. They're bedside boxes with speaker, microphone, and switch, used by patients to call the nurses. The nurses will be out at the call station (unless they're taking a nap in a vacant room down the hall), they won't be constantly checking on patients. That puzzled the U.S. nursing staff. Anyway, one was broken. Well, not exactly broken, but one of the Russian staffers had been to Louisville and seen something modern. They wanted me to magically turn it into some state-of-the-art US model. 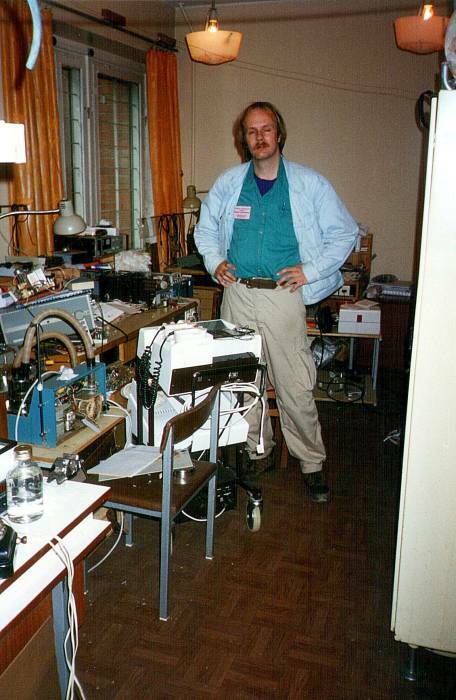 The unexpected part was that somewhere in Mother Russia there was a factory making clock radios, calculators, and hospital call boxes out of the same collection of parts, including the outer case. Plus who knows how many more household, health-care, and industrial items. That certainly made the modification easier, as I could use parts from a broken clock radio. 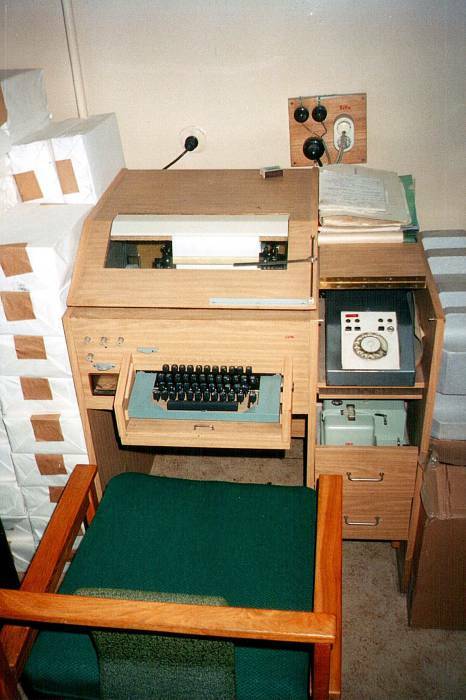 A version of this story appears at the Museum of Soviet Calculators website, which mentions that the device was similar to the MC-1103 or B3-05 models. The display panel was missing, of course, they had only used the plastic shell of the calculator. A long and narrow speaker was mounted there behind a cloth-covered grill. The keypad was completely missing, and the space normally occupied by keys was covered with a metal panel with a row of sixteen (tragically undersized) holes above the LED's. A push button on one side allowed the nurse to "talk" back to the unit in the patient's room, which was just a simple small plastic box with one button and a speaker. As I mentioned, however, they might as well have simply used buzzers in place of speakers. One day we were shown what a U.S. hospital would call the "Crash Cart", or perhaps more formally, the "Resuscitation Cart". A translation error referred to this as the "Resurrection Wagon". But given the dimly-lit hallways, the lack of internal communications, and the pokey elevators, we decided that this might be a better term for it. 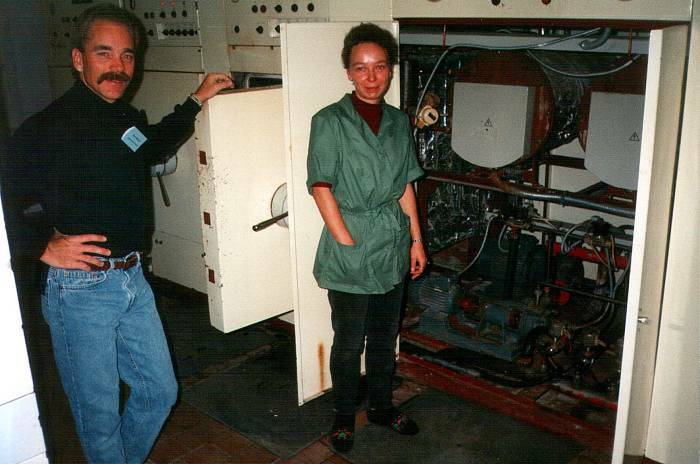 Here's one of the Louisvilniki at left, with one of the Russian engineers and yet another cabinet of machinery. 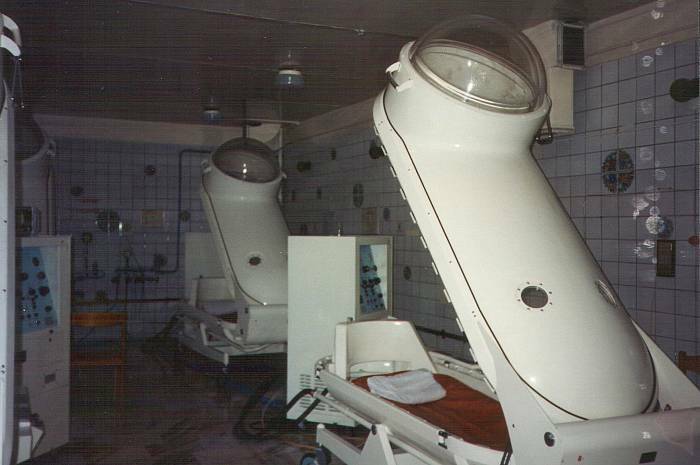 Finally, here is the futuristic hyperbaric oxygen room. Among other benefits, it speeds wound healing. One of the Louisvilniki was an ear-nose-and-throat specialist. He was taken to see the Salt Room. This was a room with walls and ceiling covered in panels of salt. It was respiratory therapy, sort of like some time at the beach and its salt air, but in the hospital. Patients sat in a recliner, listening to soft music and watching a slide show of nature scenes. Yes, the visiting ENT specialist thought this looked very much like a scene from Soylent Green. AIHA set up translators. The medical Louisvilniki got medical translators, typically in medical school or pre-med, or else language students native fluent in English. They paired me with Vlad (who was immediately dubbed "Vlad the Translator"), an engineering student. Vlad's English was better than my Russian, and between the two of us we could accomplish most anything. 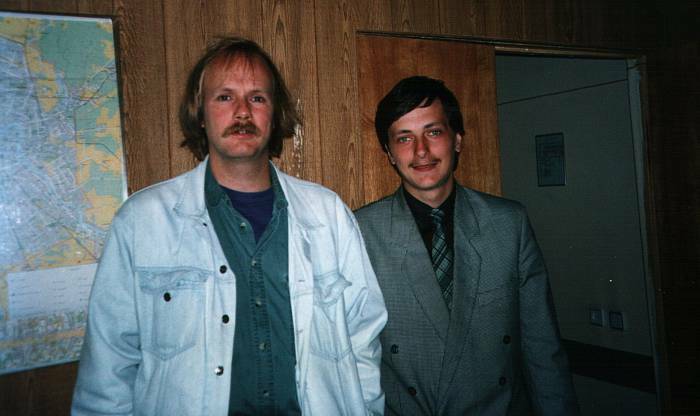 One thing we had to do at times was work together to translate from Louisvilniy to Russian. Some of the Louisvilniki spoke a nearly untranslatable language. One thing was the accent — you haven't heard anything until you have attempted to communicate with a Russian who was learning English from Kentuckians. Several times I had to ask them to speak Russian instead, because even with my faulty Russian I could understand good Russian better than I could understand their Russian-accented version of Kentuckian. For example, the number 20 would be pronounced twaahnny, or maybe twonny. Нет. «Туанны» не это по-руссси. «Туанны» это по-кентушки. Nyet. "Twaahnny" ni eto pa-angliskiy. "Twaahnny" eto pa-kentushkiy. No. "Twaahnny" is not proper English. "Twaahnny" is Hillbilly Kentuckian. On top of that, there was all the jargon, slang, and convoluted and broken syntax. So, I would translate from Kentuckian into translatable English, and Vlad would take it from that into good Russian. 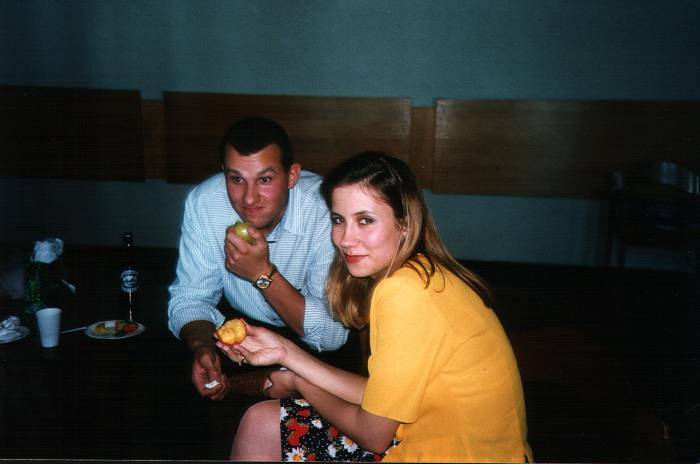 Here are two more translators, Kira and Masha. Of course the Louisvilniki, who add an "R" to the English word "wash", insisted on calling her "Marsha". I tried to correct this, briefly. You know, her name is "Masha". Yeah, "Marsha", she toll us that whall we wuz warshin the winders. Here are Masha, me, Vlad, and Yulia in an office. 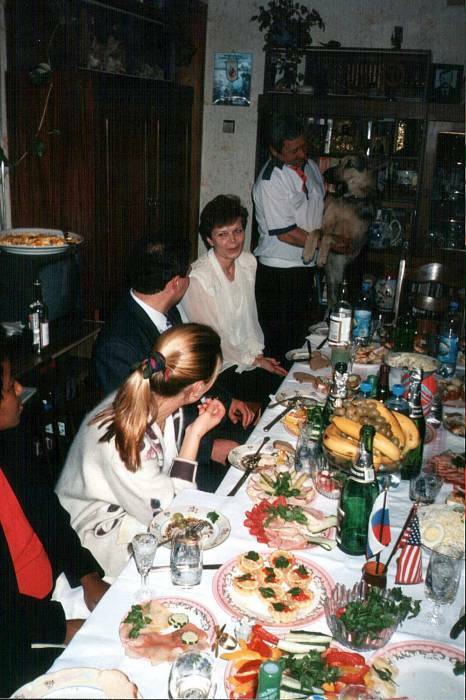 Yulia was a cardiologist, who gave up her medical position to work as a secretary for the USAID program. It was another case of physicians being paid very little, if at all, while a USAID-funded position paid better and more reliably. Tom (one of the Lousvilniki, the hospital engineer), Vlad, and Boris. Yes, we had a pair of translators named Boris and Natasha. They did not know about Moose and Squirrel, but we filled in that cultural gap. For reasons that escape me now, we were sent off one day to visit a security convention in the city. 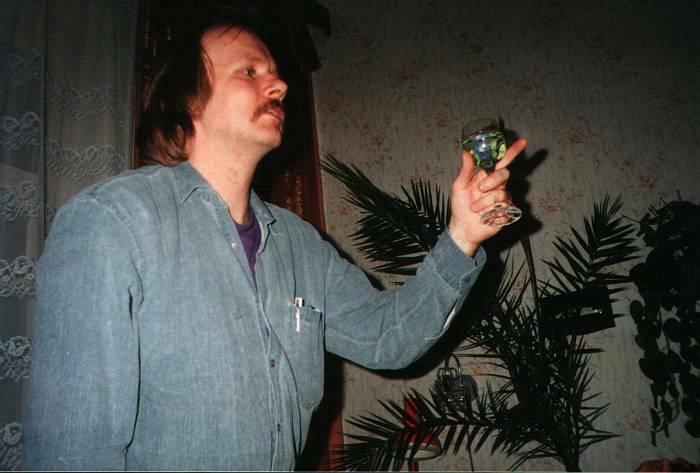 Here we are at a party in one of the hospital staff's apartment. At the party there would be much toasting. Some of it in my bad Russian. 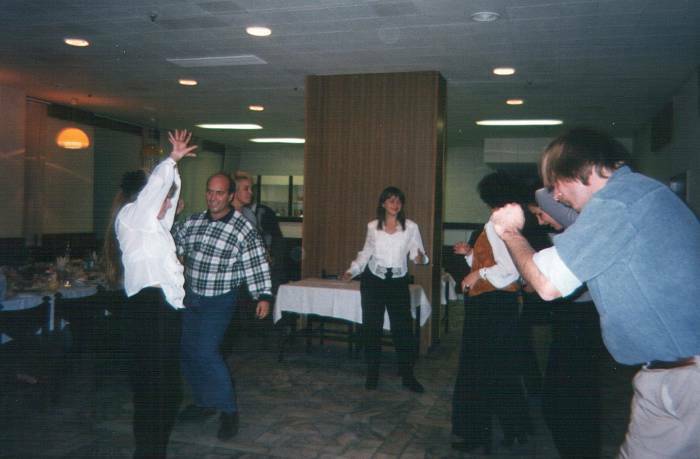 At a party at the hospital, Bad Dancing might break out. That's Natasha in white and black at center. Her dancing was much better. The head of the Louisvilniki asked me to make an accurate floor plan of the supposedly renovated hall. They weren't able to get a straight story from the Russians about how many rooms there were and what they were used for, even in just the one hall of the one floor of the kitchen. So off Vlad and I went with a clipboard and measuring tape. Most of it was pretty straightforward. Fourteen patient rooms, some with a single bed, some with two, and a couple of four-bed wards. 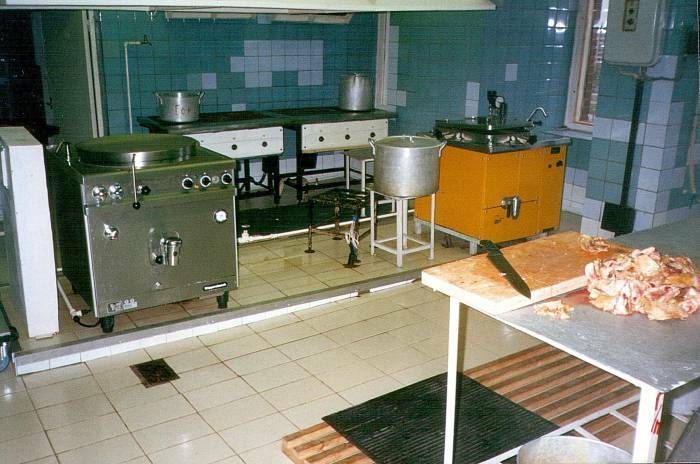 A preparation area where meals and medication could be organized. A rather cramped treatment room. The nurses' station at a T in the hall. And some storage areas. The nurses were no help — Vlad and I were just a bother, getting in the way of naps and gossip. And our measuring around the end of the hall behind the folding screen where they had set up the nap bed seemed a bit threatening. So I demonstrated a key truth to Vlad: when you need to figure something out, involve the janitor or cleaning lady. They know where everything is. The cleaning lady was a lot of help, she could (and would) explain what each room was used for, and she had keys so we could make an accurate floor plan. Having measured all the rooms around it, I could tell that the Клизма, or klizma, room was pretty large. Larger than any room on the floor other than a 4-bed ward. — So, what's a klizma? — Come on, what does "klizma" mean? — Ho ho! Do you want a klizma? — No, I'm pretty sure I don't. But what is it? A whole room just for enemas! Well, let's have a look at this. Wow. It was one enormous room dedicated to enemas. About six by seven meters on a side, with a high ceiling. 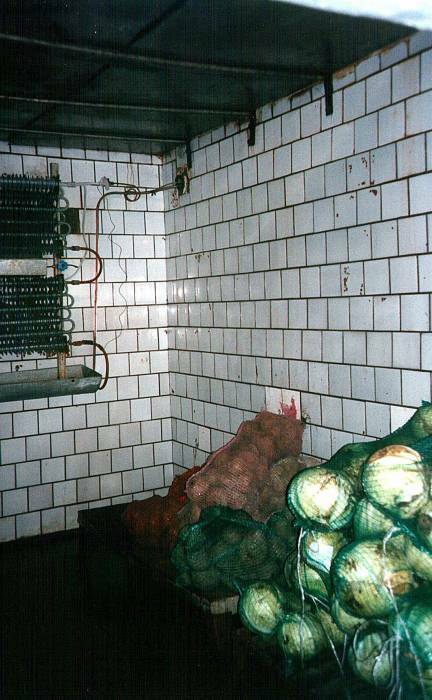 The floor and all the walls were covered in ceramic tiles with a central drain for easy cleaning. There was a large, elevated, bottomless Enema Chair positioned over the main drain. Now we could make an accurate floor plan, including the Big Enema Room. The episode led me to what I call the Enema Test for foreign-language dictionaries. Look for "enema" in the English-to-whatever section. Is it included? Not that I generally expect to need that word! But its presence indicates a fairly complete dictionary. The medical Louisvilniki told me a bit of medical lore. A troublesome patient in a U.S. hospital may find themself prescribed a 3H lavage (lavage being French/Latin for клизма). 3H — hard, high, and hot as hell.